WASHINGTON - Mysteries of the deep sea will come to light when the U.S. Postal Service issues its new Deep Sea Creatures commemorative U.S. postage stamps on Oct. 2 at the Monterey Bay Aquarium in Monterey, Calif. The stamps will be the focus of National Stamp Collecting Month. A unique live underwater unveiling from the depths of Monterey Bay will be part of the 9 a.m. PST dedication ceremony. Guests in the auditorium of the Aquarium will watch as a first day of issue cancellation is unveiled by a robot arm on the remotely operated vehicle "Ventana," an underwater robot tethered to the research vessel "Point Lobos," operating at a depth of 458 meters (1,476 feet) below the ocean's surface. Those attending the stamp ceremony, which is open to the public, may enter through the auditorium door on Cannery Row. There is a regular admission fee for entrance into the Monterey Bay Aquarium. First day of issue cancellations and sales of the stamps will also be available outside the auditorium immediately following the ceremony. 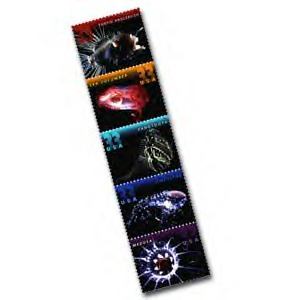 "The Deep Sea Creatures stamps provide a glimpse of fascinating and mysterious animals for adults as well as children. They offer a life-long educational experience on adaptations of the deep sea and a creative addition to the stamp collecting world," said Deborah K. Willhite, Postal Service Senior Vice President, Government Relations and Public Policy, who will dedicate the stamps. Joining Willhite at the stamp ceremony will be Julie Packard, Monterey Bay Aquarium's executive director; Marcia K. McNutt, Monterey Bay Aquarium Research Institute's (MBARI) president and chief executive officer; and Dr. Bruce Robison, MBARI senior scientist. "The deep sea is the largest habitat on Earth, but it's out of sight and mind to all but a few of us," said Packard. "By opening a small window into this vast world, we hope to show people not only its wonders, but also its importance to our future." The five life-forms represented on these stampsfanfin anglerfish, sea cucumber, fangtooth, amphipod and medusaprovide a glimpse into a vast and alien world seen by few people. The deep sea is the most expansive animal habitat on Earth, and the dominant physical factors are darkness, cold and high pressure. In response to these conditions, the creatures possess significant modifications that differ greatly from creatures that inhabit more benign regions of the sea. These adaptations include bizarre body forms and unusual lifestyles. All of the creatures on the stamps dwell primarily in the midwater range of the Earth's oceans. The midwater range includes the mesopelagic zone and the bathypelagic zone. The mesopelagic zone begins at a depth of approximately 100 meters (330 feet) below the surface and extends down to about 1,000 meters (3,300 feet), where sunlight no longer penetrates. The bathypelagic zone, approximately 1,000 meters (3,300 feet) and below, is eternally dark, except for the light produced by its bioluminescent inhabitants. All five animals on the stamp pane were photographed alive in tanks. Dr. Laurence Madin of the Woods Hole Oceanographic Institute in Woods Hole, Mass., photographed the sea cucumber, the amphipod and the medusa. Robison, of MBARI in Moss Landing, Calif., photographed the fanfin anglerfish and the fangtooth. Both worked with art director Ethel Kessler of Bethesda, Md. The band of color at the top of each stamp is a design element. With growing interest in popular stamp issues, the 812 age group has become the largest participating group in National Stamp Collecting Month and one of the fastest growing segments of stamp collectors in the U.S. This year's event, with the theme "Stamp COOL-lecting: Your Window to the World" is the 20th annual event since its inception in 1981. The Deep Sea Creatures stamps will be available at Monterey-area post offices starting Oct. 2 and at post offices nationwide beginning the following day.